The promise of the Mega Drive was always that it would deliver arcade thrills, but the truth is that original Mega Drive games often matched up well with arcade conversions in the same genre. Case in point: Thunder Force IV is one of the best shoot-’em-ups on the Mega Drive. If you can think of a key feature in arcade shoot-’em-ups, Technosoft’s masterpiece delivers it. Blistering pace? You’ve got it, and beautiful sprite work too. A stage taking place amidst a fleet of massive battleships? Oh yeah. Great music? Yes indeed, and right from the start – as the opening theme roars out of the speakers, you know you’re in for an intense experience. Oh, and then there’s the weaponry – it’s been refined since Thunder Force III, so all of your weapons are situationally useful and none is always the obvious best option. 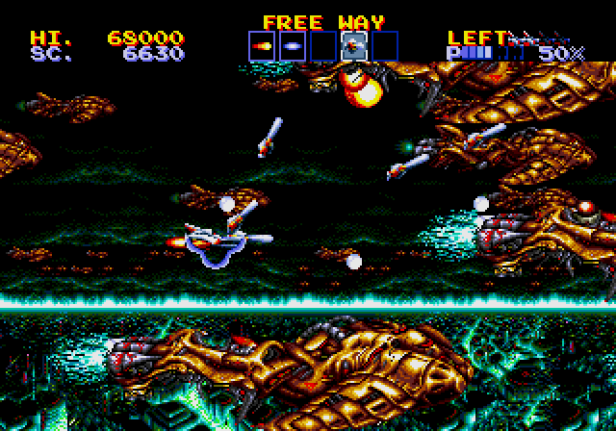 Stage design is excellent – each level feels like more than just a backdrop, thanks to unique features such as the homing guns in the Air Raid stage, the ground-based tanks of Daser and more. The enormous bosses don’t feel unfair, but will definitely provide a challenge (much like the rest of the game, really). If Thunder Force IV has any weak points at all, they are found in the moments where Technosoft simply becomes too ambitious with the Mega Drive hardware, pushing it beyond its limit into slowdown. But it barely matters – Thunder Force IV just plays so well, it’s an essential part of any shoot-’em-up fan’s Mega Drive collection.